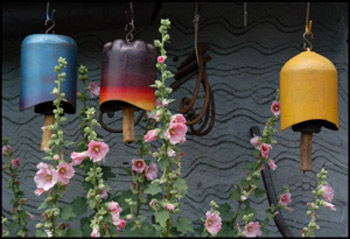 We make bells and supports for bells. All are hand crafted and consist of 95% reclaimed materials. Our bells are made from retired pressure vessels that are composed of exceptionally high quality steel, which provides for richer tones. Strikers are made of remnant hardwood wrapped with elk or buffalo hide. Our windsails are formed from scrap copper. Supports are fabricated from materials such as surplus pipe and leaf springs. This rewarding recycling project takes several forms.